For this challenge I wanted to learn gdb-peda. gdb-peda allows us to use the `pattern create` command to generate a set of input where every four bytes are unique. This property allows us to find the location(s) in our input buffer that cause a crash. Writing pattern of 2000 chars to filename "input"
On break/step, peda gives us detailed colored output of registers, the block of code, and the stack. We can see that it segfaults on mov ebp, DWORD PTR [ecx], and that peda says ECX: 0x41484441 ("ADHA"), or ECX contains part of our buffer at this line. It crashed at a new spot! This is good, as we know our last buffer patch fixed the first crash. From this we can say that buff needs to be a pointer to writable memory minus 4. We stick 0x80EE468 into the buffer at this position, and run the program. So, we know EDX is controlled by buff, and ECX just modifies EDX. We want to find what ECX’s offset is, which should be the pattern “AuAB.” Using pattern offset, PEDA tells us this is not found. At this point I opened the binary in IDA and reversed how it loaded “AuAB” into ECX. There’s a pointer above where our current crash is, and the references to that pointer show that the value of the first character was incremented by one. 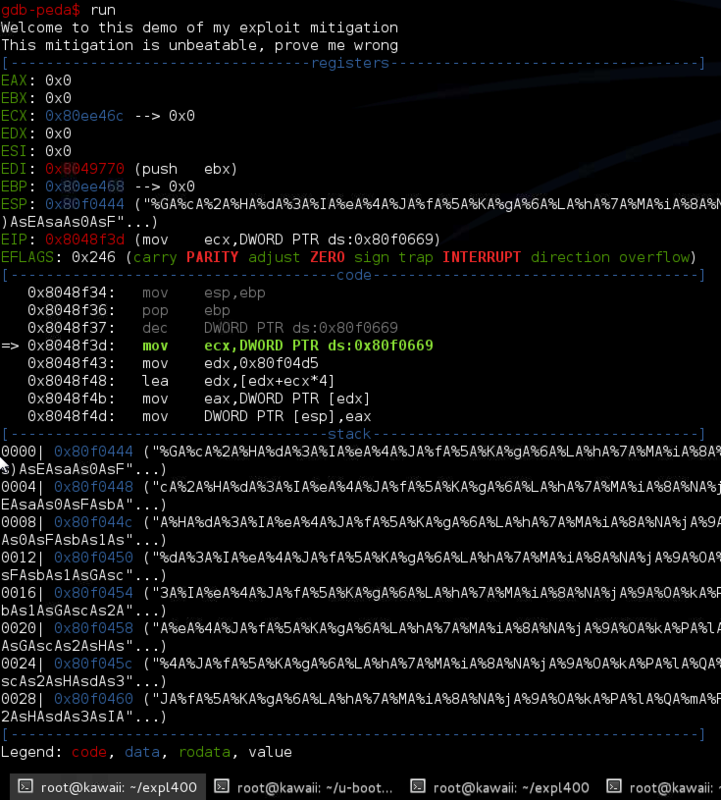 Doing a pattern offset on “BuAB” tells us buff-1 is the value loaded into ECX. Let’s return to the equation we were looking at:[edx+ecx*4]. We can store 1 into ecx via buff to zero out the right term, and we can set EDX to whatever we like via buff, for this example we’ll use our standard write address 0x80EE468. After this last update to the buffer file, gdb will tell us the program received SIGILL(illegal instruction) at 0x80EE470! This means our last update took over EIP(the instruction pointer) and caused it to execute the code at wherever buff was telling it to. Running the program with our buffer one last time reveals that buff is written to EBP, and causes it to segfault when a ret tries to use the garbage value stored there. EBP is the base pointer to the stack frame, so let’s make it our standard accessible memory pointer. We set buff to 0x80EE468 and run the program again. Looking back at our host, we see a connection! All that’s left is to send this to the server they said is running the binary. We do a simple nc host -p port < inputbuffer, and we see a connection back on our host. Doing a cat on the file “key” gives us the flag.